You have seen it on Social Media, now it's your turn to try it! Re-discover Tokyo riding our custom made street go-karts dressed up in your favorite characters from Comics, Games, and Anime!! 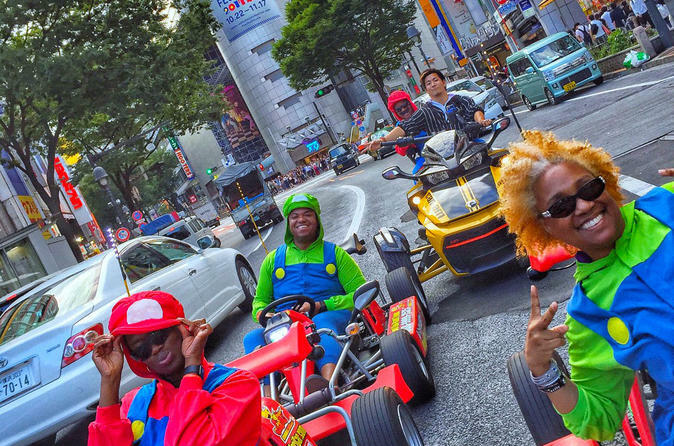 Yes you can actually ride our karts on the streets of Tokyo. Your tour will be guided by professional guides that will make sure your experience is not only fun but safe! You can choose 2-hour course or 3-hour course for this fun experience. Each course will have restroom breaks during the tour and photo breaks. This is an experience of a lifetime, and a great story to tell your friends and family, and share it on Social Media! Once you arrive at the shop, please check in, stating your name and reservation time and present your international driver’s permit and passport. Once validity of the international drivers permit is confirmed, you will be handed the "terms and conditions" and waiver to sign. Upon signature, please hand the waiver to a staff and choose a costume. All customers wear the costumes over their clothing so there is no changing room but there are lockers for your personal belongings. Once all the participants are ready, you will be briefed on how to operate the karts and lecture you on safety precautions. After the lecture, you will hop in a kart and turn on the engine. Once all engines are running, then the Guide will lead the group on to the tour. Once you leave the shop, the excitement begins! As long as you know how to drive a regular car, handling a kart is not so difficult. Just make sure to keep up with the guide because 2 to 3 hours is definitely not enough time to see all of Tokyo! The Japanese locals will wave at you, greet you with a big smile, and take pictures of you! A worm welcome you know you can’t receive just by walking down the street! You will have a short break in the middle of the tour. Yes, you will be driving for at least 1.5 hours to 2 hours depending on traffic, or little over 3 hours depending on the course. It may seem long, but most of our customers ask for seconds! 1 is never enough once you experienced THIS!